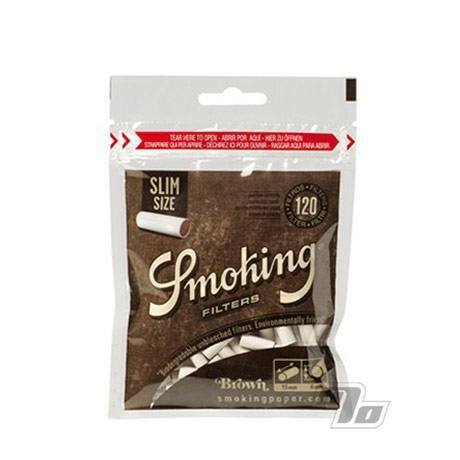 Pick up these Smoking Brown Slim Bio Cigarette Filters, made with chlorine-free unbleached fibers and wrapped with paper. These slim filters from Smoking come 120 to a pack and are 100% biodegradable! The unbleached fibers cellulose gives them a natural brown hue and is just as effective at filtering as traditional filters. Keep these filters secure with the resealable bag. Smoking Brown Slim Filters are sized 15mm in length and 6mm in diameter, suitable for slimmer roll-ups. Perfect complement to unbleached rolling papers. Roll your own, choose nothing but the best for papers, filler and filters and you'll save a ton of money over commercial packs.